Taking a bit of time off from refereeing Traveller, and got into at Call of Cthula game. I don't know if I've ever played this or not, probably not as it seems entirely unfamiliar. Around 1917 at Mrs. Dow's School, an art assistant taught classes in drawing, painting, and modeling. In addition to their daily tasks, the students prepared monthly compositions which would be critiqued by the school's art director Frank DuMond through a lecture.Art history classes included that of Italian Renaissance painting and sculpture, Western European painting, and the history of Greek sculpture, architecture, and interior decoration. MaryAnne took a stint internationally at some archeological sites despite Mrs. Dow's recommendations, and has come back to teach as a professor there while still going on the occasional dig. Born in 1900, the Professor has seen several changes in society, and is thinking that things in the financial world are not going well. She tends towards jodhpurs to the alarm of her fellow teachers and the delight of her class. Great image and, as always, good background! I hope you have a good time. It is one of my absolute favorite games. My father turned me on to Lovecraft as a child. He actually tried to apply to Miskatonic while living in Boston back in the early fifties. When CoC first came out, I was at the front of the line. I most recently ran an adventure last year. I'm sure youll have a blast! We are having a good time. Following a missing girl after getting the party all together, then suddenly disappearing from Miskatonic U and ending up in a strange forest. I did tap the knife with a pencil to see if it reacted - it did, and I lost 1 sanity point. But having an active response from the thing was fun - trying to keep up the professor talk to keep in character. Playing the lone woman in the group (fate of the die) is interesting as this is 1929. 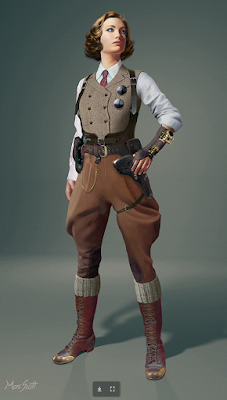 Trying not to inject gender politics into the game but the Professor is not a flapper nor a traditional sort of woman. I've a feeling she marched with the suffragettes before she was allowed to vote. The jodhpurs seem to be a fun point. It is amazing to me the sheer amount of character art you can find, and as my fellow players know, I do like visuals. I think I may have a miniature from a game that may work for her as well, although we're not using minis.